Color Darkroom is a Filter Plug-In for Adobe Photoshop®. Color Darkroom is an ICC profile editor that allows you to edit and fine tune your printer's color profiles. Eliminate unwanted color casts. Create profiles that correct for metamerism. Accurately print Duotones, and adjust profiles for unsupported paper types. If you cannot afford an expensive color calibration system costing $3500.00 or more, or have found that the less expensive systems do not work that well, Color Darkroom is for you! Color Darkroom allows editing existing ICC color profiles and saving them with new names and descriptions. After adjusting your profile, use it over and over. Print accurate colors, grays and Duotones without color casts. Correct "Spot" colors for company logos also. Color Darkroom works like Photoshop's curves, but much more powerful. It allows precise control of the colors your printer outputs. There are two editing sections that allow making overall color adjustments, or adjusting spot colors. Duotones and tinted prints must be printed with color inks. 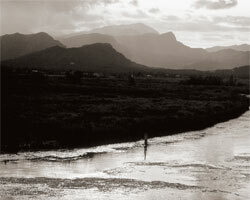 Exaggerated example of a print, before and after using Color Darkroom. Above is an exaggerated example of what can happen when printing. The example on the left was printed using no color profile. Using the printer manufacturer's color profile yielded the same results. Problem #1: Lighter colors appeared magenta, and the darker ones appeared greenish. This could be corrected by using Photoshop's "Curves". In Photoshop, the picture now appears green in the lighter colors, and magenta in the darker ones. Problem #2: After the curves adjustment, we found that that printing still produced color variations in certain areas. Over small variations of luminance, different colors appeared (in areas such as where we've outlined above). These "rainbow" colors were all but impossible to correct with Photoshop's curves, so we came up with a better solution. Color Darkroom allows you to manually edit, adjust, and save copies of your printer manufacturer's ICC color profile. No external equipment is required. Create new color profiles optimized for Duotone prints, different paper types, inks, print resolutions, graphic colors, etc. You can sample the colors to adjust directly from Photoshop layers. Color_Card.tif and Duotones_Warm_Grays.tif are included with the application. Color Darkroom's Curves Editor works like "Curves" in Photoshop. Adding the color on the opposite side of the color wheel (above) reduces that color in your print. We added green to the lighter colors, and reduced the green in the darker ones. This took care of Problem #1. Color Darkroom's Spot Color Editor took care of Problem #2, the "rainbow" colors. We sampled the duotone color from the Photoshop layer. Using the Spot Color graph, we were able to make adjustments to the curves in the problem areas. The resulting profile now works with all the brown duotones. Before purchasing, we suggest that you download the trial version, read the manual, and try the software. Make sure that you can find and edit your printer's color profile. Most printer color profiles can be edited with Color Darkroom. You will not be able to save changes to color profiles until you purchase and register the software. 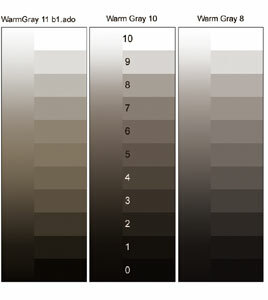 There is a chapter in the manual that explains how color profiles work. Briefly, you can think of a color profile as a multi-part filter that goes between your computer and the printer. Once you have created a color profile, you can use it with applications other than Photoshop. In addition, some printer drivers support using .icc color profiles. In this case, you can use color profiles with any application. Adobe Photoshop® 3.0 or later. Acrobat® Reader(TM) 3.0 or later. 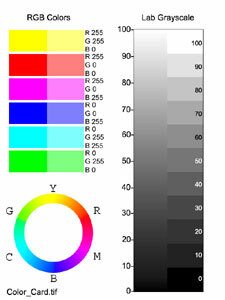 Your Printer Manufacturer's ICC Color Profile - This is usually installed with your printer driver. See our Color Darkroom Tips & FAQ's page. The following downloads are fully functional versions of the software. The installation includes the software, manual (Adobe Acrobat® format), and calibration target files (tiff format). Click on the link below to download the installation. * The trial version will allow you to save color profiles 5 times. Afterward, you will not be able to save profiles until you purchase and register the software. All purchases are final and there will be no refunds. Use the trial version to make sure your color profiles are compatible before purchasing the product.